Despite the wealth of information on transportation's contribution to the economy, debate continues on the linkages between transportation improvements and economic performance and the relative strength of these links. Focusing on freight transportation, this report summarizes the results of the Federal Highway Administration’s (FHWA’s) work on the economic benefits of transportation improvements. In addition to this summary, two analytical reports are included as appendices: 1) Economic Effects of Transportation: The Freight Story; and 2) Transportation Infrastructure, Freight Services Sector and Economic Growth: A Synopsis. Three methods—macroeconomic and microeconomic research and general equilibrium approaches—have been employed to study the linkages between transportation and the economy. Each of these is discussed in this report. Macroeconomic research focuses on the broad link between transportation spending and U.S. Gross Domestic Product (GDP). 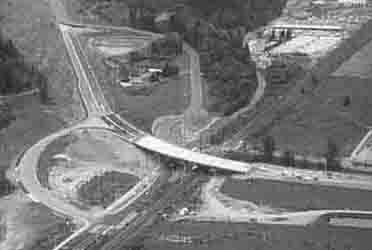 FHWA-sponsored research in the 1990s on the effects of highway investment definitively determined that highway capital contributes to economic growth and productivity, although the effect was greater in the 1950s and 1960s when the Interstate highway system was being built. Microeconomic research, particularly benefit-cost analysis (BCA), evaluates the effects of transportation improvements on individual firms, such as cost savings and service improvements. Accordingly, BCA has become an important tool for assessing the benefits of transportation investments. Traditional BCA, however, does not capture all the benefits of highway investments, particularly those realized by shippers, such as faster and more reliable delivery. General equilibrium approaches focus on measuring the benefits of transportation improvements gained from regional specialization and technological changes. The use of this method to analyze linkages between transportation improvements and the economy is still relatively new. Decisionmakers need detailed information and analytical tools to prioritize projects and determine spending levels. Since many decisions on transportation investments are made at the local level, FHWA’s Office of Freight Management and Operations is working on refining BCA to provide a fuller accounting of the benefits of transportation investments for freight movement. To date, only the benefits to carriers have been counted, ignoring the benefits to shippers. This new research documents a range of short-term (first-order) and long-term (second-order) benefits for both carriers and shippers. First-order benefits are immediate cost reductions to carriers and shippers in terms of reduced transit times and reliability. Second-order benefits include efficiency improvements and further cost reductions. These benefits result from improvements in logistics and supply chain management and changes in a firm’s output or location. Additional research was conducted to develop a benefit-cost model that could provide more accurate estimates of the benefits of freight improvements. Development of this tool will be a major gain in analytical capability, helping decisionmakers conduct both project planning and assessment in a manner that recognizes more explicitly the unique contributions that transportation improvements make to a region’s economy, particularly those that move freight more efficiently. Billions of dollars are spent annually to maintain and improve the highway system to benefit passenger and freight transportation. To understand the relationship between highway investments and national economic goals, the Federal Highway Administration (FHWA) sponsors economic research. This summary report focuses on recent research efforts by the Office of Freight Management and Operations to refine benefit-cost analysis (BCA) to provide a more realistic accounting of the benefits of transportation investments. As background information, the report also highlights past FHWA-sponsored macroeconomic research and briefly discusses General Equilibrium Approaches (GEA), another method for analyzing the linkage between transportation and the economy. The report begins by describing the challenges facing freight transportation today. The volume of freight has grown significantly over the past few decades. Between 1975 and 1997, domestic intercity tons of freight grew by about 60 percent, with the air and trucking modes experiencing the fastest growth (Eno 2002). In 1998, the transportation network moved 15 billion tons of goods valued at more than $9 trillion (1998 dollars). Freight volumes are expected to increase by another 70 percent by 2020 according to the Freight Analysis Framework (FAF), a comprehensive database and policy analysis tool. Likewise, the value of goods moved is expected to increase from $9 trillion in 1998 to nearly $30 trillion (1998 dollars) in 2020. Moreover, international trade is forecast to grow faster than domestic trade (USDOT FHWA 2002a). In 2001, U.S. international merchandise trade accounted for 22 percent of GDP (USDOT BTS 2003). The way in which goods are moved has evolved as well. Businesses and individuals now demand more flexible and timely service, increasing the importance of an efficient and reliable freight transportation system. Research on trucking has shown that shippers and carriers value transit time in the range of $25 to $200 per hour, depending on the product being carried. The value of reliability (i.e., the cost of unexpected delay) for trucks is another 50 percent to 250 percent higher. (USDOT FHWA 2002c). Another trend is the increasing use of intermodal transportation to move freight. The rise in intermodalism emphasizes the importance of infrastructure that connects different modes, especially at international gateways or where modes converge at transfer points. Consequently, not only is the condition and performance of each modal network important, but so too is how different modes fit together to provide a continuous transportation system. The growth in freight movement is placing enormous pressure on an already congested highway system. Between 1980 and 2002, truck travel grew by more than 90 percent while lane-miles of public roads increased by only 5 percent. No slowdown in freight transportation growth is in sight. FAF estimates that the percentage of urban Interstates carrying 10,000 or more trucks will increase from 27 percent in 1998 to 69 percent in 2020 (USDOT FHWA 2002a). To close the gap between demand and capacity, new public investments are needed. Investments are likely to include a mix of approaches, including adding new capacity, improving existing infrastructure, streamlining operations, and using intelligent transportation system (ITS) technologies to provide real-time travel information or gateways clearances to enhance the performance of vehicles and operators. Because of significant growth in freight on an increasingly congested network, decisionmakers in the public sector are giving more attention to the effects of congestion on freight transportation and the need for freight-specific investments. The Alameda Corridor project in California is a recent and highly visible example of a freight-specific investment that also significantly improved passenger traffic. 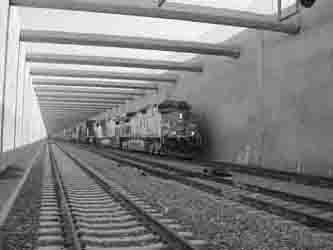 The 20-mile corridor that extends from downtown Los Angeles to the Ports of Los Angeles and Long Beach was often choked with traffic impeded at rail crossings by rail lines that snaked across the roadway at grade. The project eliminated 200 highway-rail grade crossings, widened Alameda Street, and improved traffic signal controls to reduce traffic delays, enhance safety, improve rail operations, and minimize truck drayage in and around the Ports of Los Angeles and Long Beach. These improvements are expected to eliminate an estimated 15,000 hours of delay per day for vehicles that used to wait for trains to pass (ACTA 2002). Other freight projects under development include the FAST (Freight Action Strategy for Everett-Seattle-Tacoma) Corridor serving the Ports of Everett, Seattle, and Tacoma; the Portway and Port Inland Distribution Network serving the Port of New York and New Jersey; and the Chicago Regional Environmental and Transportation Efficiency (CREATE) project. The CREATE project will eliminate 25 rail-highway crossings and 6 rail-rail grade crossings and improve rail connections and crossovers in 5 rail corridors traversing the region. Expected benefits include a decrease in local highway delay and its associated costs to motorists, a reduction in rail commuter time, and a decrease in highway-rail grade crossing accidents (AAR 2003). All of these projects illustrate the use of multimodal freight services to address the mutual interests of freight and the community. Attention is also being placed on investments in new ITS freight technologies, such as the Electronic Freight Manifest (EFM) system. In operational tests at the Chicago O'Hare International Airport and New York City-JFK International Airport, EFM reduced the time spent on processing manifests and transferring loads from one mode to another by 56 percent to 100 percent. Furthermore, processing drivers at air cargo facilities was two to four times faster than the manual, paper-based system. The time saved resulted in estimated cost savings per shipment of $1.50 to $3.50, depending on the kind of business (USDOT FHWA 2003a). On top of the economic benefits, the EFM system enhanced security through the use of biometrics and smart cards to document and control access to cargo. Significant public funding will be required to build and maintain transportation infrastructure and invest in new technologies. Investment analysis is an important part of developing future strategies for closing the gap between freight demand and transportation capacity. However, investment analysis must be supplemented with more fundamental information on the relationship between freight transportation investment and the country’s Gross Domestic Product (GDP). Quite rightly, policymakers, taxpayers, and investors need clear information to help define the appropriate level of spending to maximize transportation system productivity and public benefits. To do this, decisionmakers must have high-quality data and analytical tools. FHWA’s research on the linkage between transportation improvements and the economy is aimed at giving decisionmakers the information and tools needed to invest wisely and prioritize future projects. Despite the wealth of information that economic research has provided, debate continues on the linkages between transportation improvements and economic performance and the relative strength of these links. Disagreements over the ways in which the two are linked and over how to measure the effects are at the center of the debate. Three broad methods have been employed to study these linkages: macroeconomic and microeconomic research and General Equilibrium Approaches. A large amount of FHWA-sponsored work focused on the macroeconomic benefits of transportation investments, usually measured by how these investments would affect GDP. This work, particularly that of Nadiri and Mamuneas, is discussed briefly in Box A. Although useful in understanding the overall effects, macroeconomic studies do not shed light on the mechanisms by which investments lead to benefits. For example, macroeconomic research does not tell us how building a road improves industrial productivity or how it affects a specific area. Most macroeconomic studies have shown a positive association between infrastructure investment and economic growth. However, the degree to which the economy is stimulated is the subject of much analysis. Some of the early work in the United States (Aschauer 1989, Munnell 1990) focused on public investment in infrastructure of all types (transportation, water, and wastewater treatment) and found very large rates of return. This work came under criticism by other economists (Hulten and Schwab 1991). In particular, other researchers argued that the rates of return on public investment were implausibly high and the causation found between public investment and productivity growth might be spurious or even run in the opposite direction. To address these and other concerns, FHWA sponsored new research in the 1990s by M. Ishaq Nadiri and Theofanis Mamuneas. Nadiri and Mamuneas (1996) measured the contribution of highway capital to private sector productivity. Estimating the effect of public highway investment on the economy between 1950 and 1989, they found that total highway capital does contribute to economic growth and productivity at industry and national economy levels, although the contribution is more modest than suggested by earlier studies (Aschauer 1989, Munnell 1990) and can vary over time. Nadiri and Mamuneas found that the return on investment was highest during the 1950s and 1960s when there was a shortage of highway capital stock and the Interstate Highway System was under construction. The rate of return declined in the late 1960s as the network was completed. In the 1970s and 1980s, increasing shares of annual highway investment went to maintenance; the rates of return approached levels close to that of private investment. This suggested an adequate supply of highway capital in the aggregate. Further research by Nadiri and Mamuneas (1996 and 1998) confirmed the role of transportation investments in economic growth. Simply put, more and better roads reduce the cost of production in most industries at a given level of output by making it faster and cheaper to obtain parts and raw materials and to get finished products to market. Moreover, lower costs lead to lower prices and greater demand, which translate to a growth in output. Nadiri and Mamuneas concluded that the road-improvement program has been an enormous success with large benefits to society. Two other points are worth bearing in mind, however. First, these results are for total highway spending. Nadiri and Mamuneas’ research shows that rates of return on non-local highways, such as the Interstate Highway System, are approximately 5 percent to 7 percent higher. Second, the rates of return calculated by Nadiri and Mamuneas are for the producers of goods and services as a whole. They do not include the benefits that accrue to consumers who also use highways when they commute to work or make trips to the grocery store, for example. Since these types of trips account for a large share of highway usage, benefits are likely to be quite large. More research is needed to capture these benefits and integrate them with the work that has already been done (USDOT FHWA 1998). Microeconomic research has been conducted to determine the benefits of transportation improvements to individual firms. Microeconomic studies, which typically use a benefit-cost analysis framework, are useful in assessing individual projects, but they underestimate the overall effects of transportation investments by ignoring the benefits that accrue to shippers from cost savings and service improvements. FHWA sponsored research to improve benefit-cost analysis so that it can take these factors into account. General Equilibrium Approaches are another way of analyzing the economic effects of transportation improvements. GEA focuses on the role transportation improvements play in bringing about economic growth through regional specialization and technological changes. These analytical approaches are briefly discussed in Box B. General Equilibrium Approaches (GEA) are another way of analyzing the economic effects of transportation improvements. GEA focuses on measuring the benefits of transportation gained from regional specialization and technological changes. GEA also highlights the importance of geography in determining the effects of transportation improvements by emphasizing the notion that the benefits of a transportation infrastructure project will not be the same in different places or at different times. These benefits typically are not captured by either macroeconomic or microeconomic studies. In recent years, researchers have examined GEA to draw out its implications for analyzing transportation improvements (Appendix B). One of the main benefits of transportation is that it enables regional specialization in the production of goods. Because each region has a different mix of attributes, such as natural resources and labor skills, the ability to efficiently grow or manufacture products will vary. Moreover, when a region specializes in producing a few products, it can produce them in greater quantities at a lower cost. The benefits of regional specialization, however, go only as far as the reduction in production costs outweighs transportation costs. Hence, these benefits depend on the cost and quality of transportation. As transportation becomes cheaper and more reliable, trade will increase. Change in the demand for transportation is a good indicator of the benefits of regional specialization. Theoretically, benefit-cost analysis can capture the benefits of trade. In practice, this is a difficult proposition because benefit-cost calculations are made before project implementation. This requires an analyst to predict the effects of the project on trade, which is made even more difficult by the fact that some changes may occur over a long period of time. Therefore, an initial step in assessing the effects of transportation improvements on the economy through gains from regional specialization is to conduct a series of benefit-cost analyses on past projects. To study the full effects, analyses might be made several years or even decades after a project is completed. Although useful, regional specialization does not explain some aspects of trade. In many cases, similar products are traded between regions and countries with comparable endowments. For example, Canada and the United States, two countries similar in many ways, trade a large number of automobiles and automotive components with shipments going in both directions. Another general equilibrium approach, known as the “New Economic Geography” explains trade as a result of economies of scale and product differentiation rather than differences in endowments. Trade allows producers to reach broader markets for goods that may differ only slightly from those of their competitors. Larger markets mean economies of scale for producers. Moreover, trade in goods that differ in subtle ways gives consumers a wider variety of products from which to choose. Today’s seemingly endless variety of automobiles and electronics allows consumers to pick products that closely match their needs, thereby maximizing their utility. Product variety also suggests that today's economy is not one in which goods are completely interchangeable—a key component of what economists call perfect competition. When products are not perfect substitutes, producers maintain some power to control demand and to retain more of the gain from cost reductions. Benefit-cost analysis measures only the benefits of transportation improvements to consumers, missing the benefits to producers. Researchers have found that benefit-cost analysis underestimates the benefits of transportation improvements by 10 percent to 40 percent. Other research done under the rubric of the New Economic Geography focuses on the effects of transportation improvements in different contexts, such as location (geography) and level of development. This work emphasizes the idea that what works well in one place at a particular time may not work well in another place or at another time. Moreover, the New Economic Geography suggests that conventional benefit-cost analysis tends to underestimate overall benefits because of synergistic (or network) gains. Benefits from two improvements made together often lead to greater gains than the sum of the benefits from two projects made separately. History shows that improved transportation services have spurred major changes in agriculture and manufacturing and regional growth. The building of canals and railroads in the 19th century, for example, opened up large parts of the United States to agricultural production. In the process, large-scale production and specialization brought about transformations in production technologies and, therefore, productivity. New technologies employed in transportation can also lead to broad changes. The use of telecommunications and information technologies in freight transportation has improved the ability to coordinate shipments over long distances, lowering costs, and thereby shaping global production systems in which inputs and components are sourced internationally. Although it is generally accepted that improvements in transportation can spur technological change and vice versa, it is difficult to predict what the effects will be, how long they will take to manifest, and how they will affect different places. Nevertheless, research should continue with a view to informing public policy debates on the links between transportation, technology, and the economy. Microeconomic studies focus on the effects of transportation improvements on the economy from the perspective of individual firms. Typically these effects are measured using BCA. Benefits are either the extra profits earned by firms due to lower costs, the lower costs passed on to consumers as lower prices, or a combination of the two. Benefits may be offset, to some degree, by the negative effects of increases in transportation services, such as more air pollution. These negative effects, referred to as “external” costs, are typically borne by society as a whole. BCA considers external costs when measuring the effects of transportation improvements. To date, however, benefit-cost analyses of transportation investments, usually highway improvements, have not captured all the benefits derived from improvements in freight transportation. Models attempting to capture the benefits of highway investment to trucking have tended to parallel studies of passenger travel. The result has been that the benefits of a better road network for freight transportation are assumed to be limited to the carrier, the actual road user. These benefits are reduced travel time, decreased operating costs, and reduced costs related to crashes. Benefits to the shipper of a better road network, such as faster and more reliable delivery, are not fully accounted for in this approach. Microeconomic research, sponsored by FHWA's Office of Freight Management and Operations, has been conducted to provide a fuller accounting of the benefits of transportation investment. Phase I of this research documented a range of short-term (first-order) and long-term (second-order) benefits, which are discussed below. This report does not discuss third-order benefits, such as improved and new products, that derive from improvements in logistics and supply chain management (USDOT FHWA 2002b). Phase II of the research involved estimating these benefits across 30 freight-significant corridors using readily available data (USDOT FHWA 2003b). Both Polaroid and Ford Motor Company have taken advantage of improvements in transportation speed and reliability by reorganizing their logistics to boost their competitive position. Polaroid centralized inventories in Europe by substituting transportation for warehousing, closing a number of warehouses in the process. The annual net savings were $6.9 million from less warehousing personnel, lower inventory carrying costs, and lower insurance premiums on the remaining warehouses among other savings. Other unquantified benefits were also realized such as a discount on consolidated shipments to centralized warehouses (USDOT FHWA 2002b). Ford Motor Company reorganized its logistics by changing the way it distributes vehicles to its dealers. Traditionally, assembly plants would ship finished passenger vehicles directly to dealers, but only when a sufficient quantity of orders had been received to fill an entire railcar or truck. To shorten the average delivery time from the assembly plant to the dealer from 72 days to a goal of 15 days, Ford created what it calls “national mixing centers.” These centers, located in Chicago, IL; Shelbyville, KY; Kansas City, MO; and Fostoria, OH, act as distribution centers by receiving all types of vehicles from assembly plants and then re-shipping the correct number and type of vehicles to the dealer. The mixing center distributes vehicles by rail or truck to dealers. It is estimated that a vehicle will be held at a mixing center for less than 24 hours before being shipped to a dealer (USDOT FHWA 2002b). A reduction in transportation costs to individual firms is the most obvious microeconomic benefit of transportation investments. Highway improvements reduce costs for two reasons. First, as the network expands, the density of its links increases. This makes point-to-point trips less circuitous, thereby reducing transport distances. Second, the addition of new roads, the expansion of existing ones, or operational improvements such as incident management or ITS deployment, may decrease congestion and travel times in some places. In either case, the amount of transportation input per unit of production—measured in vehicles-miles and vehicle-hours—goes down. Hence, costs are reduced, and productivity is improved. In addition to reducing costs by decreasing transit-time, improved reliability is an important benefit of highway investment. Improved reliability allows firms to realistically predict the amount of buffer-time in the delivery of goods. (Buffer-time is the amount of time a carrier builds into a trip to reduce the risk of being late.) A reliable buffer-time also allows firms to reduce inventories and the costs associated with storing goods at various stages of the production cycle, a feature of just-in-time delivery. This is a major benefit since nearly 28 percent of production in the United States is based on just-in-time delivery (AASHTO 2002). One implication of just-in-time delivery systems is that inventory reductions are achieved at a cost of consuming more transportation services. At the system level, this means that more trucks are on the road at any given time, leading to more congestion. Second-order benefits of transportation investments include improved efficiencies and further cost reductions resulting from a firm’s ability to consolidate production and warehousing facilities (Box C). By consolidating, firms can take advantage of economies of scale and lower costs associated with fewer facilities. Consolidation, however, leads to an increase in the average length of haul. Trip length increases overall because shipments that were transported to and from the closed facilities must now be moved to and from the remaining facilities that are farther away. Thus, economies of scale are achieved only at the cost of more transportation services. As noted earlier, at the system level, this means more traffic on our roadways. Transportation improvements also increase the range of possible locations for manufacturing plants and distribution facilities, another second-order benefit. In some cases, transportation investments may make it possible for firms to improve their productivity by clustering facilities in a certain place. This is known as agglomeration economies. In other cases, transportation improvements may allow a firm to reduce its land costs by choosing a low rent location away from dense activity centers. Furthermore, transportation improvements may enhance productivity by adding value to the output of either the shipper or the carrier. For example, fresh fish is worth more than frozen or processed fish. Transportation improvements that make it possible to deliver fresh fish to markets in relatively short timeframes expand markets to locations where the product has a higher value. Other commodities that can be produced only in a limited number of places are similarly enhanced by cheaper and more reliable transportation, such as mineral water from a specific location. Value is also added by technologies, such as the EFM system noted earlier, that allow carriers to provide real-time tracking information about a shipment. Such information enhances a shipment’s value to a client in many ways, including the ability to more accurately schedule other resources involved in the production, receiving, or distribution processes. Dell Computer’s on-line sale of custom-configured computers is one of the foremost examples of the use of just-in-time delivery and its effects on the production process. Using just-in-time delivery of components and tight inventory control, Dell is able to ship a customized computer within 36 hours of receipt of the order. This system allows Dell to reduce parts inventory from an industry norm of 75 days to 100 days to just 6.6 days, decreasing its inventory costs dramatically (USDOTFHWA 2002b). Based on the theoretical work discussed above, FHWA sponsored additional research to enhance the measurement of benefits arising from transportation investments. The main thrust of this work was to develop an analytical model using readily available data to estimate the causal links among highway performance, truck freight rates, and shippers’ demand for highway freight transportation. Data on truck traffic, truck freight rates, congestion levels, and economic activity levels in 30 selected freight-significant corridors were used to estimate the value that both carriers and shippers place on improved highway performance. The model was designed to quantify first-order and second-order benefits detailed in phase I of the research. The analysis estimated the demand for highway freight movement in relation to highway performance while accounting for the effects of other more dominant factors such as the overall level of economic activity, labor rates, and fuel costs. Researchers used truck vehicle-miles traveled in each corridor to measure demand and the volume-to-capacity ratio to measure highway performance. Posted trucking rates for less-than-truckload (LTL) companies were used in a cross-sectional analysis, and trucking rates from a rate bureau were used for a time-series analysis. Although there were some challenges along the way, the modeling did provide a statistically valid range of estimates of the relationship between the demand for trucking and highway performance. At the high end of the range, the model estimated that a 10 percent decrease in congestion increased the demand for trucking by about 1 percent, other things being equal. The availability of data and concerns about data quality were among the challenges encountered in the development of the model. For example, only LTL rates were available for the cross-sectional analysis. And, in some of the corridors, data contained large, inexplicable variations in congestion estimates. Moreover, in some cases, the researchers found it very difficult to account for all the factors that explain freight rates and demand for trucking. When trying to explain the variation in freight rates, for instance, the researchers could not successfully control for the fact that the most intense competition among trucking companies, usually leading to lower trucking rates, often occurs in the most highly traveled and congested corridors. Despite these problems, the benefit-cost analysis model enabled an estimation of the full benefits of highway improvements. As noted previously, current models are deficient in that they take into account only those benefits that accrue to carriers. They do not take into account benefits to the owners (shippers) of the freight being transported by trucks. Yet, as the examples of Dell, Ford, and Polaroid show, shippers do benefit substantially. A statistically valid estimate of shippers’ demand for highway carriage provides a relatively simple means for adjusting the results from existing models to reflect the full benefits of highway improvements. Preliminary results of the phase II research suggest that the benefits found in current benefit-cost models should be increased by about 15 percent to account for these newly measured effects (USDOT FHWA 2003b). It is important to note that an improved benefit-cost analysis model will also enable an evaluation of an increase in highway performance regardless of whether it is brought about by infrastructure investments, ITS improvements, or some other means. As long as the increase in performance could be measured accurately, BCA would serve as an effective tool in evaluating the benefits of transportation improvements. FHWA’s research into the economic effects of investments in transportation will continue to focus on providing a more accurate, more detailed, and broader perspective on the benefits attributable to highway system improvements and the possible economic costs of system deterioration. Although valuable insights have been gained, additional research is needed. Current plans are to develop an improved benefit-cost analytical model that will provide better estimates of the benefits of improvements. The development of an improved model will be a major gain in analytical capability. Such a tool has the potential to help decisionmakers conduct both project planning and assessment in a manner that better recognizes the unique contributions of freight transportation to a region’s economy. Although improving benefit-cost analytical models will provide much-needed help in assessing the links between transportation and the economy, it is not the only answer. Benefit-cost analysis should be supplemented with insights from other analytical perspectives. These include macroeconomic modeling, transportation and industry case studies, and new approaches, such as GEA, that are sensitive to the economic and geographical context of new transportation investments and their effects. Pursuing several analytical approaches also reduces the chance of missing significant characteristics of, and changes in, systems as complex and dynamic as transportation and the economy. Making good investment choices for the transportation system will be critical to enhancing America's economic productivity and global connectivity. Over the past 25 years, goods movement has grown dramatically in size and complexity. Increased freight volumes are already straining the system and are expected to continue to grow. The transportation system will have to adapt to this growth, requiring, in many cases, substantial government investment. A better understanding of the linkage between transportation investments and the economy will help decisionmakers select the most cost-effective investments and prioritize freight projects for future consideration. The introduction of a more comprehensive understanding of transportation benefits into traditional economic analysis is greatly needed, and FHWA continues to work toward that end. Alameda Corridor Transportation Authority (ACTA). 2002. Alameda Corridor Project, A National Priority. Fact Sheet. American Association of State Highway and Transportation Officials (AASHTO). 2002. Transportation—Invest in America, The Bottom Line Report. Washington, DC. Association of American Railroads (AAR). 2003. The Chicago Regional Environmental and Transportation Efficiency Program: Local and Regional Benefits. Washington, DC: September. Aschauer, D. A., 1989. “Is Public Expenditure Productive?” Journal of Monetary Economics, Vol. 23, pp. 177-200. Eno Transportation Foundation. 2002. Transportation in America 2002. Washington, DC. Hulten, C.R. and R. M. Schwab, 1991. “Public Capital Formation and the Growth of Regional Manufacturing Industries,” National Tax Journal. 43: 121-34. Munnell, A. H. 1990. “Why has Productivity Growth Declined: Productivity and Public Investment,” New England Economic Review. January/February: 2-33. Nadiri, M. Ishaq, and T. P. Mamuneas. 1996. Contribution of Highway Capital to Industry and National Productivity Groups. Report prepared for FHWA. Office of Policy Development. Nadiri, M. Ishaq, M. and T. P. Mamuneas. 1998. Contribution of Highway Capital to Output and Productivity Growth in the US Economy and Industries. Report prepared for FHWA. Office of Policy Development. U.S. Department of Transportation (USDOT), Bureau of Transportation Statistics (BTS). 2003. U.S. International Trade and Freight Transportation Trends. Washington, DC. U.S. Department of Transportation (USDOT), Federal Highway Administration (FHWA). 1998. A Summary of “Contributions of Highway Capital to Output and Productivity Growth in the US Economy and Industries.” Available at https://www.fhwa.dot.gov/policy/nadiri2.htm as of April 26, 2004. U.S. Department of Transportation (USDOT), Federal Highway Administration (FHWA). 2002a. Freight Analysis Framework. U.S. Department of Transportation (USDOT), Federal Highway Administration (FHWA). 2002b. Economic Effects of Transportation: The Freight Story. White paper prepared by ICF Consulting and HLB Decision Economics, Inc. January. U.S. Department of Transportation (USDOT), Federal Highway Administration (FFHWA). 2002c. Creating a Freight Sector within HERS. Prepared by HLB Decision Economics, Inc. November. U.S. Department of Transportation (USDOT), Federal Highway Administration (FHWA). 2003a. Intermodal Freight Technology Evaluations: Final Results. Washington, DC: November. U.S. Department of Transportation (USDOT), Federal Highway Administration (FHWA). 2003b. Analysis of Benefits of Highway-Freight Improvements. Freight BCA Study—Phase II Report. Prepared by ICF Consulting and HLB Decision Economics, Inc. November.